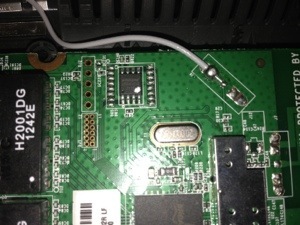 Lately I did some hacking with this router, and since I couldn’t find any information about the serial port and especially about its pinout I decided to publish what I found out. First: to take the router apart you need to remove the 3 screws which holds it together. Two of them under the rubber feet which could be easily removed, the third is however a little bit tricky: you need to remove the little star-shaped rubber foot which is close to the right end of the router (if the ports are looking to the left). After you removed all screws you need to apply some amount of force, and possible a flat screwdriver to crack the case open. Don’t worry, the plastic is quite durable, so give it some force if necessary. I haven’t done any testing with the ? holes since having only ground, RX and TX is enough. Now don’t forget, you need to connect your cable’s RX to the router’s TX and your TX to the router’s RX. After you connect your adapter start Putty, then power up the router. You can see the boot-messages. If you hit Ctrl+C 4-5 times immediately after powering up the router you can stop the boot process and access the CFE menu. The big GSM write-up â€“ how to capture, analyze and crack GSM? â€“ 4. The big GSM write-up â€“ how to capture, analyze and crack GSM? â€“ 3.
domi007 on The big GSM write-up â€“ how to capture, analyze and crack GSM? â€“ 3.
domi007 on The big GSM write-up â€“ how to capture, analyze and crack GSM? â€“ 4.
domi007 on How do you get the Kc from a SIM card? domi007 on The big GSM write-up – how to capture, analyze and crack GSM? – 1.